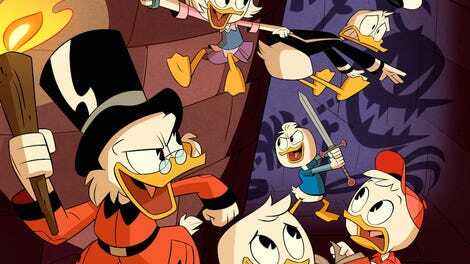 The DuckTales crew is off to Scotland - or the Ducks’ Universe equivalent of it - for a country club golf outing that suddenly becomes a ghoulish, high-stakes, back-nine-of-death competition in “The Missing Links of Moorshire.” DuckTales have had some pretty outlandish episodes during both it’s past and present runs, but this one is certainly one of the nuttier ones, an episode that feels more comic-booky than usual. That’s partly because how everyone just randomly discovers the giant rune circle in the midst of the woods just outside the fairway. No need to waste time with a gradual setup. The crew finds the runes. The curse immediately is dropped. The kelpies appear and explain the rules. And we’re off, golfing away while staying a head of murderous fog. "The Missing Links Of Moorshire!" When it comes to episodes that thrive on outrageous premises, DuckTales is at its best when it functions with a full, or semi-full ensemble. All the characters have been established within clear, defined roles, allowing everyone to bounce off each other, even as the dangers escalate. Here, Huey and Launchpad play the role of commentators, with Huey’s straight-forward(ish) commentary contrasting with Launchpad’s hilarious confusion. Grounding this bit with Huey’s absolute determination to nab a Junior Woodchuck Guidebook merit badge with Launchpad’s general cluelessness keeps this bit focused. Louie, in fine, lazy form, mooches cash off Glomgold’s inexplicable desire to have a caddy, and again, it’s a pairing that functions well due to the contrasting nature of the two: the nephew’s indifference butting up against the second richest duck’s malevolent passion. And we can’t forget Webby, who excels at her first foray in cheerleading - perhaps a bit too much though. But the emphasis here is on the relationship between Dewey and Scrooge, so far the most interesting and richest relationship the show has developed so far, and one that feels like a solid continuation from what was established in the second half of “Woo-oo!” Dewey is the one who is most emphatically looking to follow in Scrooge’s adventurous footsteps, and Scrooge is more than happy to oblige. The conflict, therefore, takes on another layer: it’s not just that Scrooge is jealous of Dewey’s natural, if unorthodox, method of playing golf, it’s that it flies in the face of the entire teacher/student dynamic. (At to that Scrooge’s internal struggle about feeling too old and disconnected from his adventures, and it makes for a palpable story.) It’s such a rewarding moment when Scrooge lets go of his jealousy and lets his nephew go for that final shot, beyond the fact that it’s a life-or-death moment. Broadly speaking though, “The Missing Links of Moorshire” is just a fun and fitful episode, which doesn’t expand the show so much as it culls together much of what has been established so far. The animation and backgrounds continue to be rich and vibrant, the bright, warm greens of the opening moments contrasting nicely with the dark, brooding, moody atmosphere of their venture through the haunted course. The story itself, scripted by Ben Joseph and as over-the-top as it is, has a stronger sense of pacing and development than, let’s say, “The Impossible Summit of Mt. Neverrest!” in which its “wormholes did it” ending felt tacked on. DuckTales has always established nonsensical, ludicrous adventures, but now it feels like the show is seeing them all the way through till the end. The ridiculousness of Junior Woodchuck Guidebook merit badges will always be gold within the Duckverse. 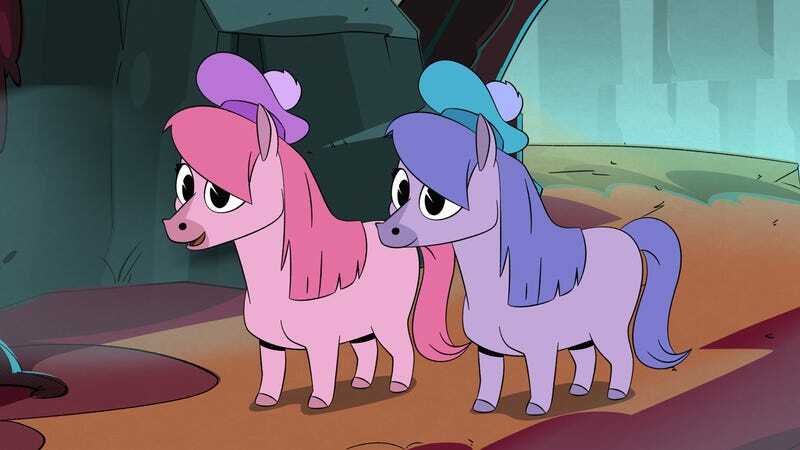 Tara Strong and Andrea Libman, who voices actually ponies from My Little Pony: Friendship is Magic, voice the two demonic kelpies who just love killing - by drowning their victims. This bit of meta-knowledge only makes their appearance and behaviors even funnier. “Talking animals wearing clothes!” is not only a clear self-aware joke, but also a pretty layered one if you also note that, technically, the Duck-verse characters see themselves as humans. My desire to want Donald back, beyond his comic persona, is due to his contrasting parenting style to Scrooge’s, and how that creates conflicts between them in their own right. I know the emphasis is on the nephews in this show, but that is dramatic gold right there.